Want to get rid of that old stuff laying around the house? Maybe you want to clean out the shed, and make a few dollars in the process.... 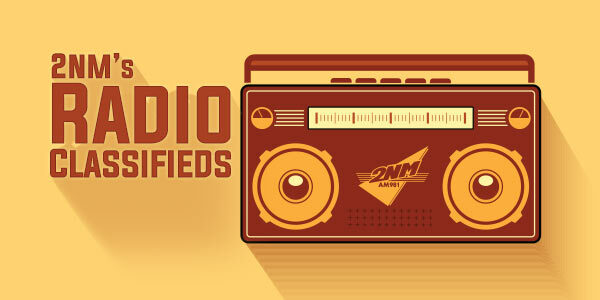 If you have something to buy, sell, or swap, 2NM's Radio Classifieds is here to help. Keep it locked on to the 2NM Cruze every Friday afternoon from 3. It's the most interactive buy, swap and sell site on the airwaves in the Upper Hunter.